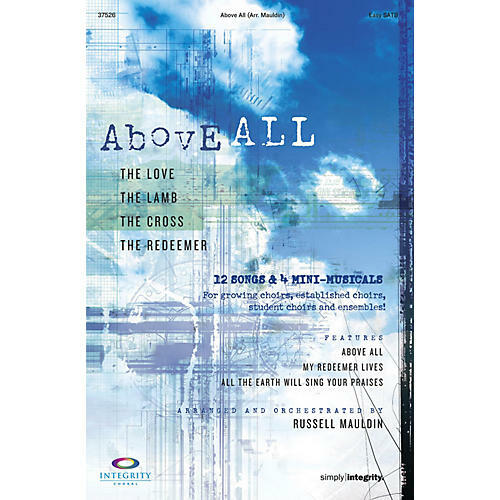 Above All features 12 powerful songs that are sure to find a place in any Palm Sunday, Easter or Communion service. This collection is ideal for choirs, ensembles and student choirs, and the songs can be performed individually or in four mini-musicals leading up to Easter. As a finale, the DVD Accompaniment Trax features powerful visuals for the last three songs. Titles include: O Wondrous Love, The Glories of Calvary, Lord of Life and Love, Above All, Behold the Lamb. For All You've Done, O Mighty Cross, I Will Glory in the Cross, All the Earth Will Sing Your Praises, God So Loved, Saved the Day, My Redeemer Lives. Orchestration includes score and parts for Flute, Oboe, Clarinet, Trumpet 1, 2, 3, Horn, Trombone 1, 2, 3, Percussion 1, 2, Violin, Viola, Cello, String Bass, Rhythm (Piano/Guitar/Bass). Instrumentation varies. SATB, Listening CD, CD Accompaniment Trax (Split), DVD Accompaniment Trax, Orchestration, CD 10-Pack, CD Preview Pack also available.